Shop On Stage MY320 Condenser Shock Mount Microphone Clip from AMS and enjoy Fast & Free Shipping. The MY320 condenser shock mount clip is designed to reduce the effects of low-end rumble and floor vibrations. Ensure high quality recordings by eliminating the unwanted noise that can creep into your music through your stand. 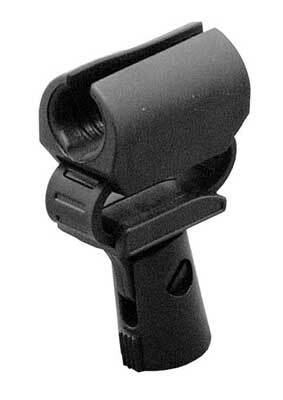 The MY320 condenser shock mount clip features a 5/8 inch-27 female threaded insert in a plastic base with a 20mm opening for condenser microphones. These work great for drum mics! Perfect replacement for the d-vice clips that break. Great! Using for my Audix D6 mics on bass drum & floor tom mics to keep from stage floor noise. Because of the design and material I was a bit reluctant about these, even though I use a lot of this brands products. I was happy to find that for my situation these worked out very well. I use these in conjunction with drum mics they fit the bill and do what I need at an exceptional value. I have a bunch of these now, including their "dynamic" counterparts.